SD is a brand new Series for Cobalt, now approaching its fiftieth year building fibreglass boats, and indeed is Cobalt's first foray into the increasingly popular deckboat market. Overall for 2012, Cobalt offers 27 models in seven series ranging from twenty to almost thirty-three feet in length in bowriders, cuddies, mini-cruisers and the WSS Water Sports Series. 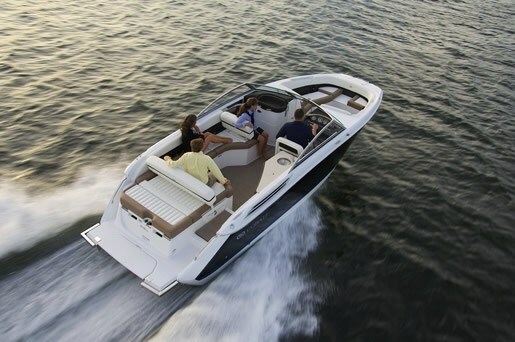 The new 26SD is currently the only model of Sportdeck offered. The construction of the 26SD follows Cobalt's hull design and construction philosophies of an extended running surface, deep-vee, and 21-degree deadrise hull with taller hull sides for a drier ride. Construction-wise, Cobalt incorporates composite materials on all structural components including honeycomb composites and Kevlar™ reinforcement of the hand-laid hulls. A fading resistant gelcoat and Z-Thane blister resistant barrier hull coat is utilized with tapped aluminum backing plates on all through-bolted hardware. “Fun follows function” was Cobalt's design philosophy for its first deckboat with the objective of incorporating performance, adaptability, and innovation, the true hallmarks of the deckboat phenomenon. 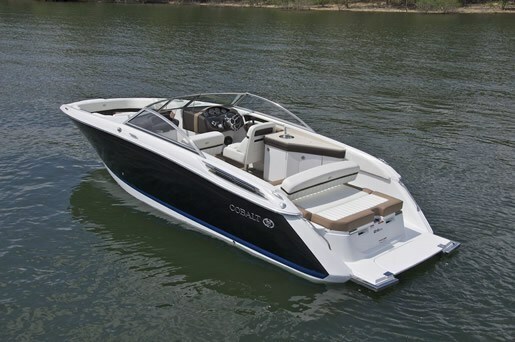 In Cobalt's own words, “the 26SD is every bit as much about skiing and wakeboarding as about quiet conversation on a leisurely cruise.” Cobalt has certainly seemed to achieve all of the above in the 26SD. Let's check it out. 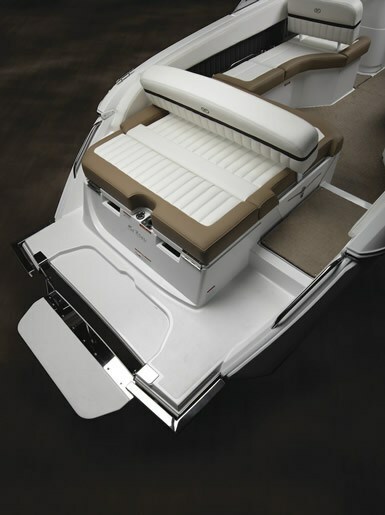 Flexible seating arrangements seem to be a key priority in any deckboat and Cobalt has paid particular attention to its seating both in total amount and in its flexibility. In its standard configuration, the entire cockpit is comprised of seating and lounging. A massive portside L-shaped lounge starts at the passenger helm area and contours its way back and across the transom. It is double-wide at the passenger helm providing two forward-facing seats, or flip the backrest, and it becomes a double-wide rear-facing stretch out lounge or spotter's seat. The same with the transom section of this lounge which is at least 3-persons wide and its backrest also flips forward to create a huge transom sunpad / lounge. The helm seat is an adjustable, well bolstered individual bucket and behind it on the starboard is another available cockpit seat. Most will choose the optional cockpit galley with sink, trash receptacle, storage, and refrigerator in place of this extra seat. In the bow, more wrap-around lounge-type seating is found with collapsible armrests and huge storage areas below, a welcome feature of the cockpit seating as well. In-floor storage is ideal for watersports accessories. A dinette table with bow and cockpit receptacles is optionally available as are a host of other options to personalize your sportdeck. A very decent sized head compartment with sink and storage console is accessed via a hinged door in the passenger helm. A porta-potti is standard but go for the porcelain electric option. Snap-in 40-ounce neoprene-backed carpet is standard but the optional Sea Grass (Sand & Terra) shown in the model at the January Boat Show was certainly impressive. A bow walk-thru door and a transom walk-thru gate are both desirable and standard equipment. The standard stereo is an AM/FM/single CD with six speakers, a dash-mounted remote, and an iPod/MP3 port. Go wild with the optional premium sound system and all of its available goodies, especially if teenagers are a big part of your boating lifestyle and/or premium sound is. 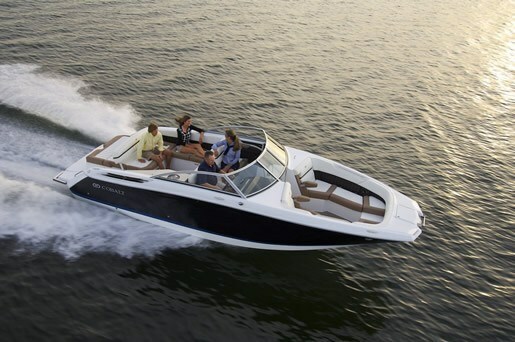 Base power is a single 320 horsepower from either MerCruiser or Volvo Penta – the former being the 377 Mag MPI ECT B3, and the latter the 5.7 GXiC DP – both being dual propeller drives. Upgrade to an 8.2 Mag MerCruiser with 380 hp or 430 hp in the HO version, or to an 8.1 GiC from Volvo Penta with 400 hp. In a boat that's 27'6” overall, weighing 5,500 pounds dry, and intended for lots of passengers plus family watersports of all kinds, and probably with lots of passengers on board at the same time, I would probably be convinced to choose the higher power. The optional DTS (Digital Throttle & Shift) from MerCruiser and EVC (Electronic Vessel Control) from Volvo Penta is also a recommended addition. Lots and lots of other options are available to precisely match your boating lifestyle and to create the perfect 26SD to your taste. Spend enough time reviewing the option list to ensure you will be completely satisfied with the results. Cobalt has gone all out with this its first attempt at a deckboat and appears to have left no stone unturned to create a boat well suited to its intentions and to the demands of its highly discerning market. 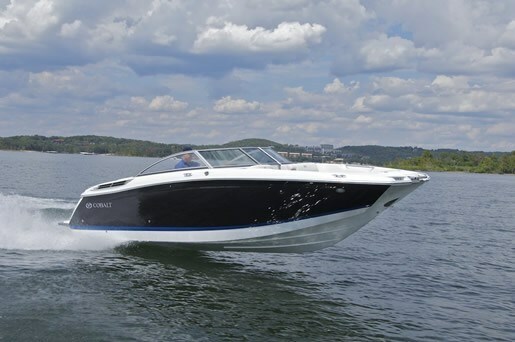 It would appear that Cobalt has indeed satisfied its objectives that “the 26SD is every bit as much about skiing and wakeboarding as about quiet conversation on a leisurely cruise".